Pasha Rugs is the home of the Largest Collection of vintage, antique and new handmade Turkish and Persian Rugs in the Eastern U.S. Visit our store in Lambertville, NJ, located just across the bridge from New Hope, PA or shop online. We are located near Doylestown, Newtown, Yardley, Flemington, Princeton, Hopewell, Pennington and Clinton. We are happy to deliver to your home throughout Central New Jersey and Eastern Pennsylvania as well as give you an opportunity to try your rug before making a commitment. Being in our store with the colorful glass lamps, handpainted ceramics and handmade rugs and rug products is a vibrant experience many will only otherwise have in the Turkish Bazaar. 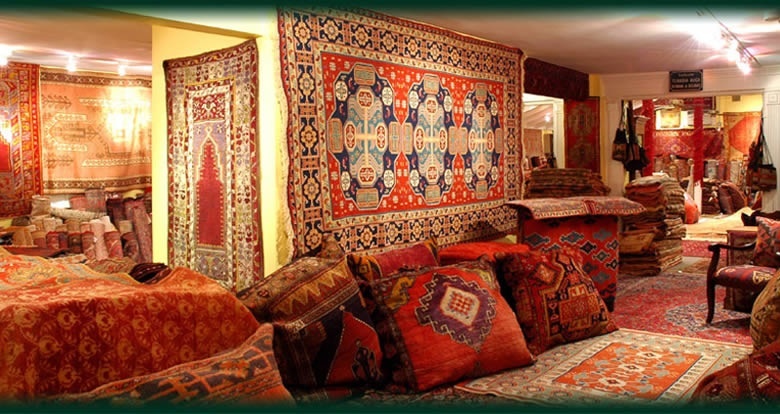 You can bring the mystery of the Orient into your home with beautiful, handmade Turkish Rugs, Oriental Rugs and Persian Rugs and Carpets as well as other Turkish finery. Pasha Rugs carries both antique and new rugs in all styles and sizes--including traditional prayer rugs. Our rugs are imported by us and are chosen for their beauty, quality and authenticity. Our flat woven rugs include Kilims, Cicim, Zili and Sumak. Our pile rugs include Tulu, Oushak, Tebriz, Tribal, Heriz, Peshawar, Kazak, Turkoman and Caucasian. Each rug is handmade and unique. Most are wool rugs, though we also carry silks. You can be assured your rug, whether you choose a handmade rug from Turkey, Azerbaijan, Afghanistan, Persia, India, Nepal, Turkmenistan or Pakistan, will be a one-of-a-kind work of art. Many investments in handmade rugs become family heirlooms. Our rugs are of the quality that will last for generations (some of our antique rugs already have and are ready for more!). Quality handmade rugs hold their value and become even more beautiful with age. So whether you are looking for area rugs to warm up your floors, a kilim to decorate your walls, a small rug to warm up that certain spot in your living room or a handpainted ceramic piece to accent your table, you are bound to find it here at Pasha Rugs. Liven up your home with weavers' talents and dreams.